Now you can offer your valuable guests the service of having their favourite magazine at your hotel. The Meganews Kiosk is daily updated with the latest issues and instantly accessible for your guests. The guest easily chooses his or hers magazine, and the magazine is printed and ready within two minutes and they can choose to have it delivered to their room or to pick it up at the front desk. To make the process even smother, they pay for the magazine via their room bill. As hotel manager, you can of course chose the have this extra service free of charge for you most loyal customers. That is up to you. But you can also use Meganews Kiosk to bring extra revenue to your hotel. The Meganews Kiosk has a strong international and high quality content. We are working with some of the worlds largest and most well known publishers and titles. In the Kiosk you can find titles as Time, People, Health, Popular Mechanics, Money, Fitness, Sports Illustrated and Fortune. Just to give some examples. Please feel free to contact us if you want to have more information about us and our concept. Meganews Kiosk for Airports, Shopping malls and Train stations. 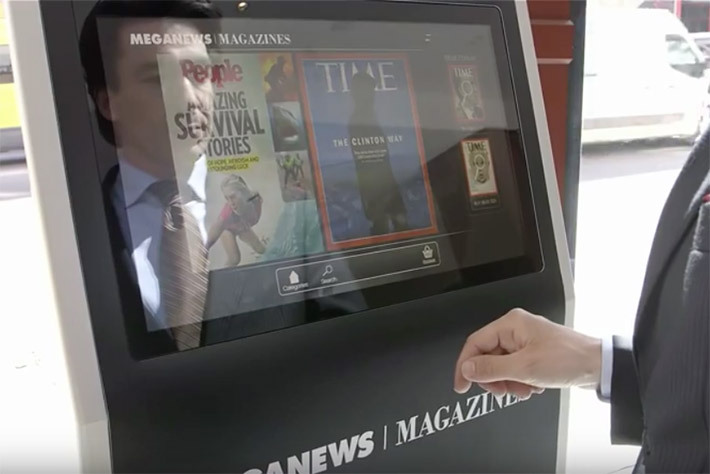 The Meganews Automatic Magazine Kiosk is a Print on Demand Kiosk where the customer easily service them selves and chooses the magazine they want, pay with their credit card and then the magazine is printed and delivered automatically within two minutes. The Meganews Kiosk is perfect for locations with a high flow of people as airports, shopping malls, train stations, food courts etc. 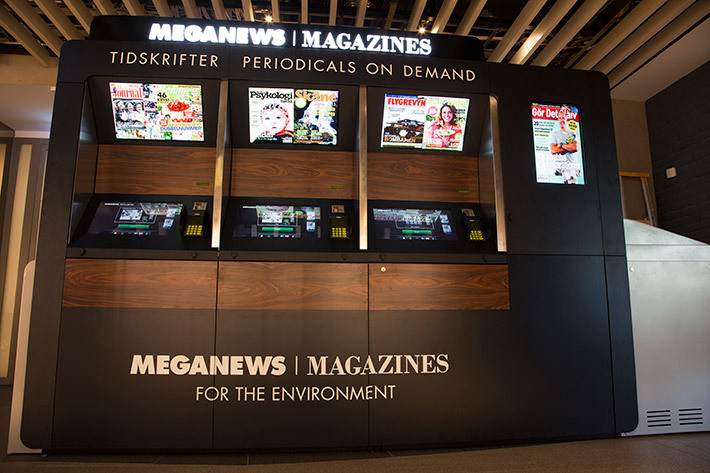 The Meganews Kiosk provides magazine to a high quality, fully comparable to an ordinary printed magazine. The Meganews Kiosk has a strong international and high quality content. We are working with some of the worlds largest and most well known publishers and titles. In the Kiosk you can find titles as Time, People, Health, Popular Mechanics, Money, Fitness, Sports Illustrated and Fortune. Just to give some examples.